How to Measure Your Age! How long you’ve lived is clearly one way to measure age — but if aging is about the gradual decline of body function and eventual mortality then perhaps there is another contender for the best way to measure age – your fitness. And unlike your calendar age, you can actually change your fitness. In my last two posts I talked about my personal experience reducing blood pressure by improving fitness and the massive published data validating the link between fitness and aging induced blood pressure. Now a group of Norwegian researchers from HUNT University have published a study looking at ~38K men & women who they followed-up for a mean duration of 24 years to demonstrate that fitness was a very good predictor of mortality at all age levels and perhaps the best predictor for those less than 60 years of age. Every 1 MET increase in fitness resulted in 15% lower risk of all-cause mortality amongst men and 8% lower risk amongst women. In this particular example fitness was estimated using demographic + activity data (which gives a rough indicator but is not that accurate). The accompanying NYT article has more detail on the study and related research. 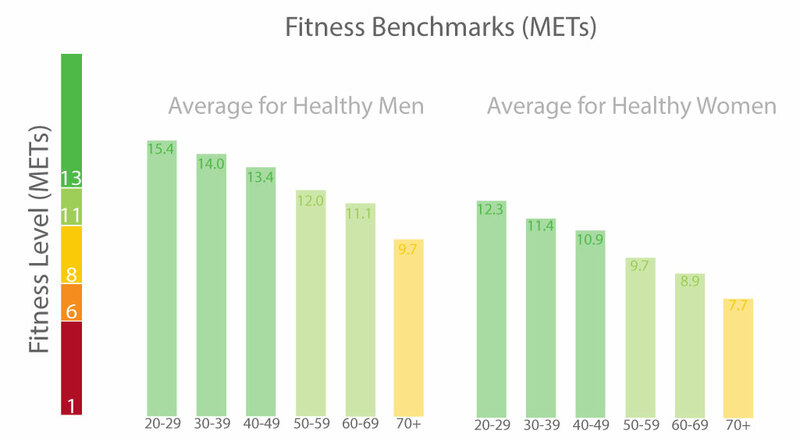 The group also created a really cool online calculator — you can plug in your data and get an estimate of your fitness, compare it to age cohorts. Worth trying out! Reproducing the talk that I gave at the Quantified Show & Tell in Boston on how I was able to eventually improve my fitness and blood pressure when I shifted to anaerobic interval training. Siva Raj was interested in lowering his blood pressure. With a family history of cardiovascular disease and heart attacks he was worried about slightly elevated blood pressure (pre-hypertension). 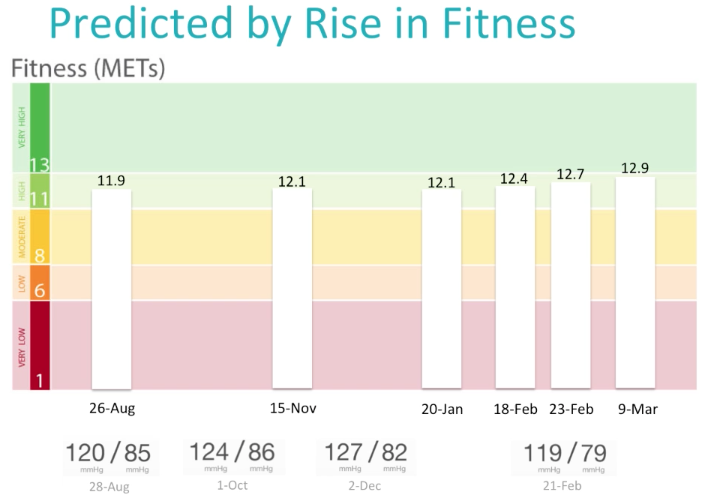 As someone engaged with understanding and building fitness applications he thought he would be able to lower his blood pressure by staying on track with a regular exercise program that focused on cycling. Interestingly his blood pressure measurement didn’t respond to his constant exercise or weight loss. After reading more research literature about the link between fitness and cardiovascular health Siva decided to change his training to improve his fitness. He decided to incorporate a increased intensity into his routine. After a short period of time he had increases in this fitness and was able to observe the reduction in blood pressure he was looking for. In the video below, filmed at the Boston QS meetup group, Siva explains his methods and talks about how he was able to track his body’s response to different fitness routines.